Canada is a hotspot immigration destination for the millions of overseas immigrants, which immigrate here every year in huge numbers. However, thousands of applicants often couldn’t get success in the Canada Immigration due to various reasons, i.e. inability to interpret or follow the procedural guidelines, technicalities of the procedure, unawareness about the latest Express Entry System and many other such issues. Under all such circumstances, the question arises that whether an applicant need the consultant for the immigration to Canada or not? Let’s try to find out the answer of this question by exploring the benefits of hiring an immigration consultant. 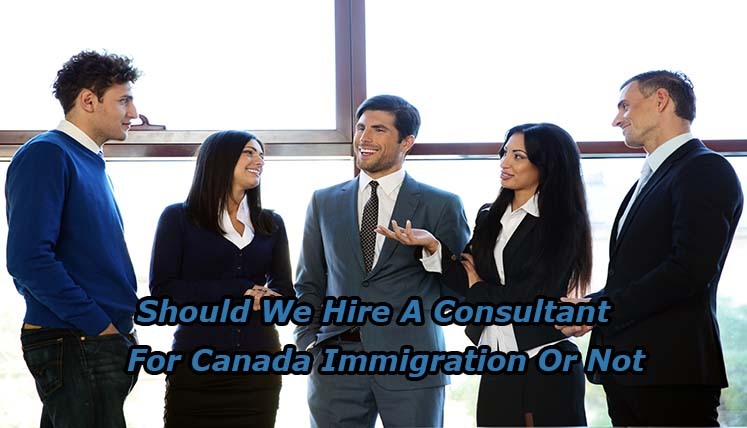 Why one should hire a Consultant for Canada Immigration? Well, it has been observed that the immigration procedures of various countries often contain many unfamiliar terms and complex procedural guidelines which a layman often doesn’t understand or interpret, hence, the need of a Consultant is essential. The Immigration System has become more technical: With the advent of new Express Entry System of Canada Immigration the immigration procedure has become more and more technical and complex for a layman. Hence, an Immigration Consultant works as a mentor, interpret or and guide for an applicant to interpret and help the candidate to follow the procedure without any fault. Online Procedure: There are many candidates, who are not so tech savvy and often find it difficult to follow the online procedure, i.e. online profile creation, EOI Submission, ECA through WES, and so on. The immigration Consultants being experts, become a great help for the applicants in terms of online immigration procedure completion. Visa application monitoring and follow ups: The Immigration Consultants often represent you in dealing with the immigration office and authorities and correspond on your behalf to monitor and follow up the application on your behalf. Hence, a lot of your headache is relived on hiring a reliable Immigration Consultant. CIC has announced Severe punishment for false representation or misleading information: The CIC is very strict about the fraud or misrepresentation of facts during the visa procedure and documentation. Such mistakes even may occur if you misinterpret something during the visa filing or profile creation. Hence, you must hire an expert immigration consultant to complete your Visa Procedure with pinpoint accuracy and eliminate every chance of wrong or inappropriate information. Key tips and updates shared: The qualified and experienced Immigration Consultants often remain updated with latest procedure and guidelines and hence guide you the best way. Moreover, they know the tips and ways as to enhance your Express Entry Score, i.e. ways to find the Canadian job offer, ways to get the nomination from a province and so on. All such aspects matter a lot when it comes to getting selected in the Express Entry Pool or get selected from the pool for permanent residency. Hence, hiring a reliable, trusted, and experienced Immigration Consultant can really prove a huge help and a factor in your selection for Permanent Residency in Canada. How to find a reliable Immigration Consultant for Canada Immigration? Well, if you are planning to immigrate to Canada, you need to go through a multifaceted immigration procedures and documentations to create an Express Entry Profile, submit EOI, and subsequently apply for a Canadian Visa. In case, you miss out on any key aspect or procedural guideline, it could lead to a denial of your candidature, which is the last thing you would want, as the visas needs to be approved within a limited period of time most of the time.